Hi, I'm Dr. Jim Carlson, Holistic Veterinarian. Welcome to my profile! When I was a full time farmer, a job that I was born and raised in, I never thought that I would have to find another career. But the economic crisis of the 1980s left me searching for my next step and I didn't have to look too far. We didn't have a lot of visitors on the farm I was raised on so visits from the veterinarian were interesting, scientific and sparked something in me. I took the large animal track in vet school but my plans to be a cattle nutritionist were derailed when I got married to my wife, Cristen, who had a mobile career as a television meteorologist. We moved to Ohio and my career makeover happened. One makeover that I'm happy to report was highly successful. You see, cattle vetting is great and cows are my secret favorite animal (even though I don't own one), but the connection between a farmer and their cow is more economic than emotional (most of the time). But the connection between a human and their companion animal, dog, cat, horse, ferret.... that's all heart and soul and that's where it got me. My love for companion animal medicine was also quite frustrating for a few years. I came out of veterinary school with one way of thinking: conventional medical treatments only. But some of my patient's outcomes were not where they should have been and it honestly was upsetting to me personally. Instead, I saw organ damage from long term use of drugs, vaccine reactions and no options in some acute cases but to wait it out until the pet got better or passed away. That just wasn't OK with me. I don't have a problem with the way I was taught in veterinary school but I needed to find a way to help animals through other means. My process of treating patients has changed to encompass all elements of holistic care. Alternative cancer treaments, custom holistic testing, energy medicine, acupuncture, herbs, cold laser therapy, Tui Na, natural food therapy and aquapuncture. If you like harmonics and gems, I can even incorporate that into your pet's care. It took years of study to offer the most complete, customized holistic offerings in the Midwest region. While holistc veterinary medicine is a new buzzword in the industry, I am happy to offer all the services your pet needs from allergies and sensitivities to a custom holistic food plan, lymphatic drainage problems, ovary sparing spay and cancer treatment. In 2012, I purchased this practice and have quickly developed it into a holistic center for dogs, cats and equine patients. All appointments with me include an integrative approach bridging both conventional medicine and all realms of holistic treatment. I offer vaccines tailored to your pet's lifestyle. Grove Animal Hospital & Holistic Center passed the American Animal Hospital Association re-certification process with its highest score ever in 2013. In 2010, I purchased this practice from Dr. Khader Shakir. Since then, I have incorporated holistic care into the practice, upgraded the facility and our team developed the clinic into an American Animal Hospital Association certified practice. I offer energetic medicine, acupuncture, herbs, natural food therapy, aquapuncture. 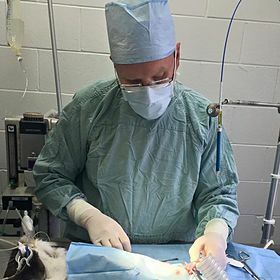 I was the first veterinarian in Illinois to offer ovary sparing spay and trained other doctors in this procedure. We customize your pet's vaccines to its lifestyle. We now offer rabies and distemper titer testing and a Free Vaccines for Life program. Holistic medicine is truly a lifestyle for us and is incorporated in all appointments with me. I owned Springfield Animal Hospital 8 years and served clients throughout Ohio with regular clients coming from as far away as Tennessee, North Carolina, Florida and Utah. I enjoyed being part of the Springfield community. For about 12 years, I was the Pet Doctor on Channel 2 - WDTN news, a position I began while my wife worked there as a meteorologist. My family made the decision to sell the practice to move closer to family in the Midwest. I worked as an Associate Veterinarian in my first small animal practice position. This was a high volume practice where I learned more about skills from nutrition to surgery. This was my first job out of college. My dream was to continue working in agriculture and I became a large animal veterinarian in my home state of Iowa. In this position I worked with local dairy farmers, cattle farmers and at the sale barn testing cows for diseases such as brucellosis. I worked extensively on emergency call and the best part of this position was delivering baby calves into the world. This was a great experience, but I moved on to join my new wife who had taken a position in Ohio. The National Animal Disease Center has programs focusing on treating and eradicating diseases. I worked in the Department of Zoonotic Diseases with buffalo in the brucellosis program. Brucellosis is a zoonotic disease that can be passed to humans and is still prevalent today. At the NADC, My job functions included caring for the research cattle and bison. I had a favorite buffalo who was named Tulip. Farmer at Darwin Carlson & Sons, Inc. This was my family's farm corporation. I grew up on the farm between Gowrie and Farnhamville, Iowa. Farming is a way of life and I'd return to this in a minute if the economy were more favorable to farm families. I left the farm when I began vet school at Iowa State University in 1994.